1. A water reservoir in a city is normally filled in 8 hours but takes 2 hours longer to fill because of a leak in its bottom. If the reservoir is full, in how many hours will the leak empty it? The Leak empties the tank in 40 hours. Negative sign indicates it is a draining pipe. 2. In the figure given below, ∠B = 38°, AC = BC and AD = CD. What is the value of ∠D? (3-6) Study the following graph carefully and answer the question based on it. 3. What was the percentage drop in the number of C-type tyres manufactured from 2012 to 2013? 4. What was the difference between the number of B-type tyres manufactured in 2013 and 2014? 5. The total number of all the three types of tyres manufactured was the least in which of the following years? 6. In which of the following years was the percentage production of B-types tyres to C-type tyres to maximum? 8. If p + q = 2, then find the value of p3 + q3 + 6 pq. 9. The sum of three numbers is 168. The ratio of second and the third number is 7: 9 and the 1st and the third are as 8: 27, what is second number? 1) A water reservoir in a city is normally filled in 8 hours but takes 2 hours longer to fill because of a leak in its bottom. If the reservoir is full, in how many hours will the leak empty it? 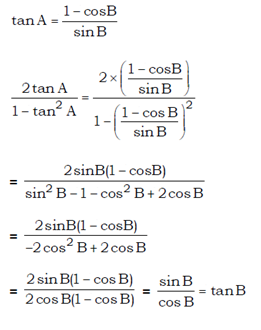 2) In the figure given below, ∠B = 38°, AC = BC and AD = CD. What is the value of ∠D? 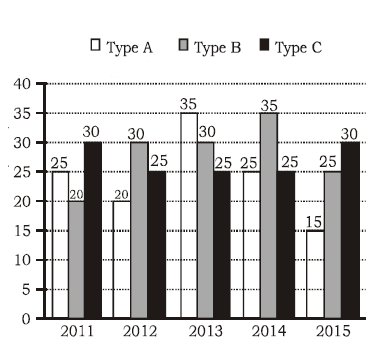 3) What was the percentage drop in the number of C-type tyres manufactured from 2012 to 2013? 4) What was the difference between the number of B-type tyres manufactured in 2013 and 2014? 5) The total number of all the three types of tyres manufactured was the least in which of the following years? 6) In which of the following years was the percentage production of B-types tyres to C-type tyres to maximum? 8) If p + q = 2, then find the value of p3 + q3 + 6 pq. 9) The sum of three numbers is 168. The ratio of second and the third number is 7: 9 and the 1st and the third are as 8: 27, what is second number?